Tell me if this scenario sounds familiar: You pour yourself into writing a blog post that you just KNOW your audience will love. You’re so excited about the post that the words just come flying out. The post almost seems to write itself! 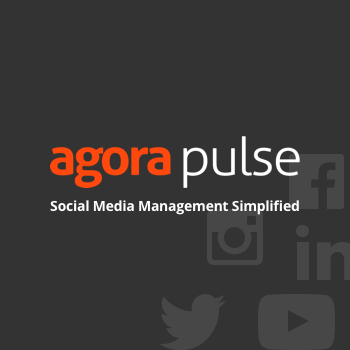 Finally, you hit the publish button and wait for the likes, shares, and comments to start rolling in. And you wait…and wait…and wait. Crickets. Nadda. Nothing. Uggghhh, right? To say this is discouraging is an understatement. But it doesn’t have to be this way. 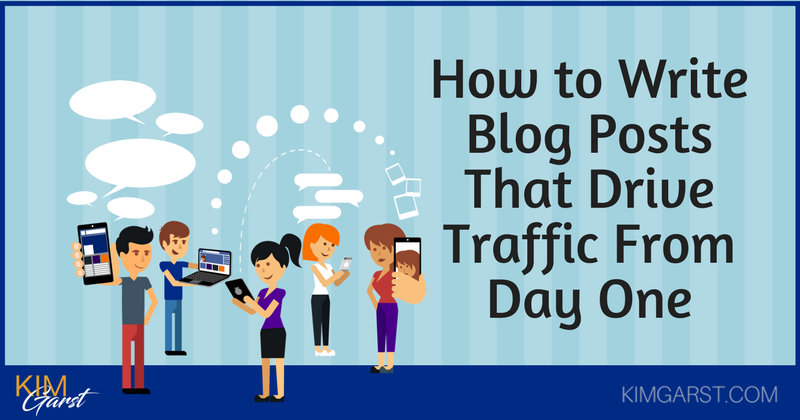 You can learn how to write blog posts that drive traffic from day one. There are strategies you can use to pretty much ensure your blog posts drive traffic right from day one – and then continue to drive traffic for months to come. This post will walk you through the exact strategies I use to write blog posts that drive traffic traffic from social media, the Google machine, and other websites. *Note: While your blog post can potentially start getting social media and referral traffic from day one, don’t expect to get traffic from the search engines for at least a couple of weeks (or even longer). SEO is a long-term play, but one that pays off BIG TIME when you are consistent! Your very first step will be to figure out what your audience wants to read…not just what YOU want to write about. This is absolutely the foundation of writing blog posts that will drive traffic, and that will eventually make money. (link make money to How To Make Money From Your Blog Part I) If you carry out all the other steps in this post perfectly – but don’t write something your audience cares about – you’re doomed to fail. Finding popular and relevant topics takes some detective work, but is well worth the effort. The process will involve looking at a variety of sources to find topics, questions, and issues that your target audience is already talking about. 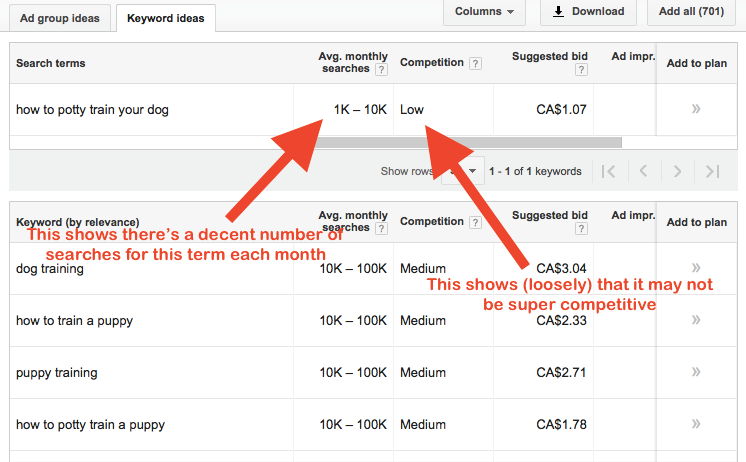 Using keyword research tools: Using tools like the Google Keyword Planner (pictured above) and Wordstream’s Free Keyword Tool, plug in general themes you think your audience would be interested in. Look for phrases that seem to be relatively popular (but not TOO popular; these will be harder to rank for), and that you know you could write a great post about. Survey your audience: Survey your audience using Facebook surveys or a tool like SurveyMonkey to see what they really want to learn about. Look at your analytics: Your website and social media analytics can be powerful tools for figuring out what’s worked with your audience in the past. Consult your analytics to see which posts have gotten the most likes, shares, and traffic, and find related topics you can write about. Listen in on relevant conversations: Using a tool like Hootsuite, track social media mentions of words and phrases related to your business or industry. You can also join industry Facebook or LinkedIn groups, or online forums to see what topics come up regularly. Listen to what your audience has already told you: Look through your emails, blog comments and social media mentions to find questions or problems your audience has already asked about. Use Buzzsumo to see which topics have already done well: This is one of my all time favorite tools! Buzzsumo lets you search for a topic, and then shows you the web’s most popular articles on that topic. This will give you an idea of what people really want to know about and what they are sharing! Use what you’ve learned to inspire new topic ideas. Note: If you’re currently writing your very FIRST blog post, you’ll need to take a slightly different approach. 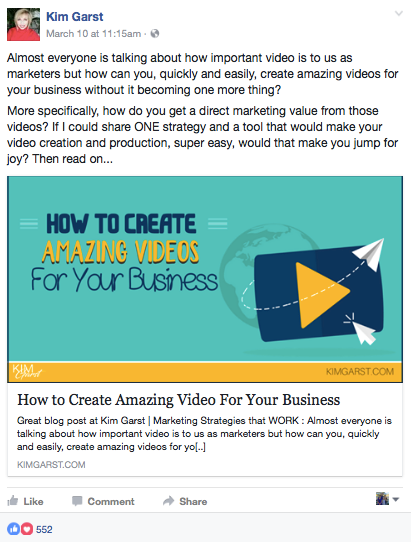 But for every post after that, you can use the strategy outlined in this post! This is a great tip, both for determining the topic of a new blog and for writing new blog posts. Has this topic already been covered a thousand times before? If the answer is yes, I highly recommend “niche’ing down”. What does this mean? It means narrowing down the topic even more to cover subtopics or angles that no one else is writing about. For instance, let’s say I figured out that my audience really wants to know more about how to train a puppy. My keyword research showed me that “dog training” and “puppy training” are both highly competitive phrases, meaning it would be nearly impossible for me to rank for those terms in Google. 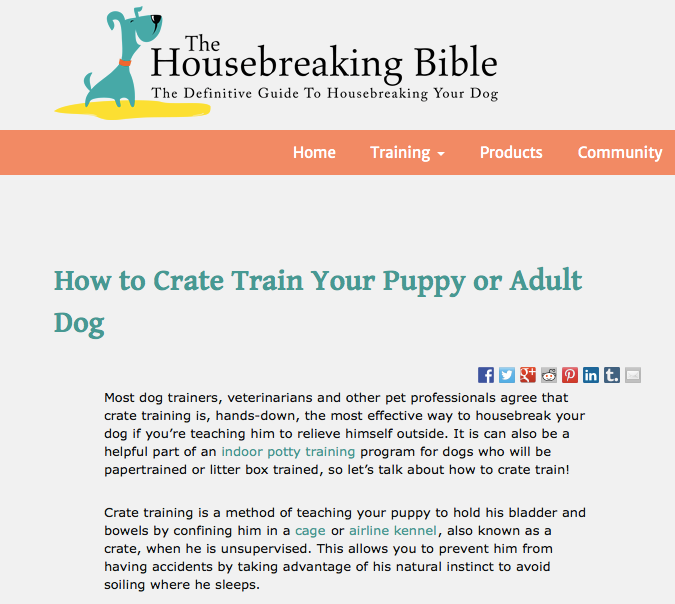 However, I also found some other, longer phrases that don’t seem to be quite as popular, but that also don’t seem to be quite as competitive; for instance, “crate training a puppy” and how to potty train your dog”. I call this low hanging fruit that is just waiting to be swooped up! Pro tip: Before you decide on a topic you’re going to write about, I’d also encourage you to type it into Google and see what comes up. If the top results are all big-name sites (e.g., PetSmart, Ceasearsway, etc.) you’ll probably want to choose another niche topic that’s being covered only by smaller blogs. Make a list with a variety of subtopics you can cover in your post, and then move on to #3. Now that’s you’ve come up with a specific topic and subtopics, it’s time to actually write your blog post. However, it’s vital that you cover the topic in sufficient detail so both Google and your readers find value in your post. Gone are the days of writing a very general, 400-word post and attracting traffic with it! The trend now is to write much longer, more comprehensive posts that cover all angles of your topic. 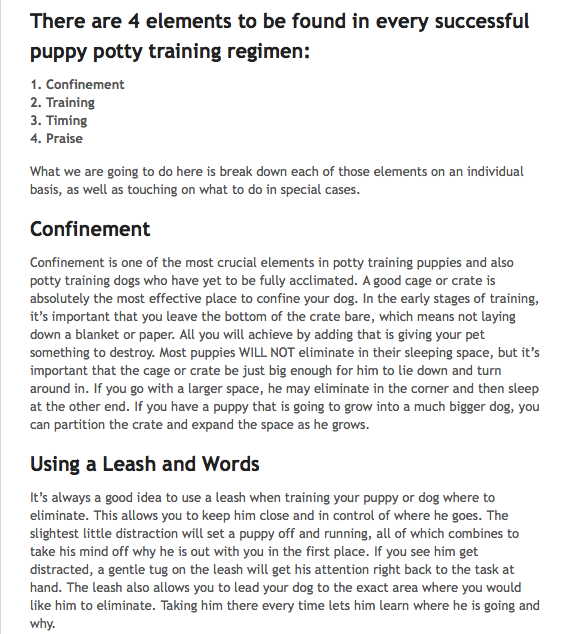 For instance, if I were writing about “how to potty train your dog”, I’d want to come up with a variety of subtopics to cover in my post. These could be “The most common strategies you can use for potty training”, “The most effective method you should use”, and “The best age to start potty training a puppy”. Put yourself in the minds of your readers: What topics and sub-topics will they want to know about? What burning questions are they likely to have? Once you’ve answered one question, what other questions will naturally follow that one? Generally speaking, in-depth posts will tend to rank better in Google. Research seems to indicate that 1,500 words should be your minimum length if you want your post to rank in the search engines. Some experts recommend shooting for 2,000-3,000 words. Be sure to test out a variety of lengths to see what works best with your audience and in your niche! While the precise use of keywords isn’t quite as important as it used to be (Google has gotten REALLY good at figuring out what posts are about! ), you still want to make sure you’re using them in your post. 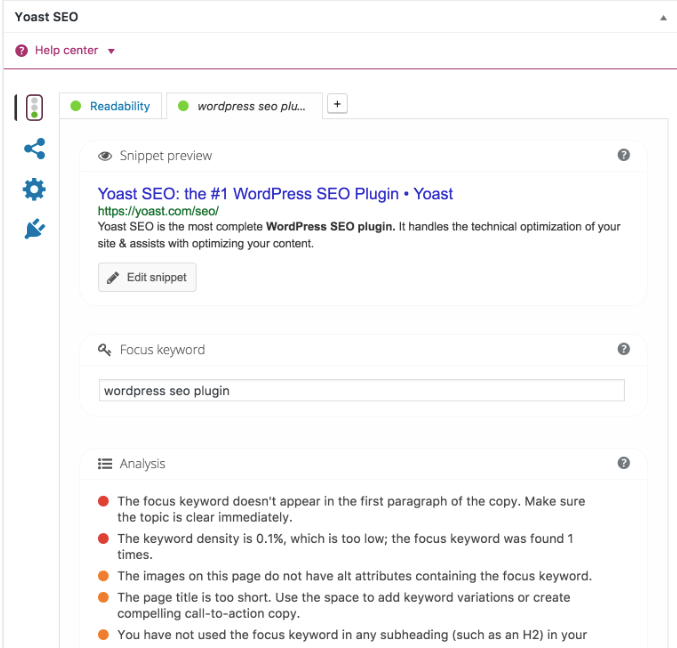 If you want to make sure you’re using your keywords appropriately, use an SEO plugin like Yoast SEO (you’ll need to have a WordPress blog for this). It will help ensure you’re using your keywords in important areas of your post. Internal linking is one of the most important things you can do to rank in the search engines – and yet many bloggers completely forget to do it. Internal linking is simply including links to other pages and posts on your own site. For instance, if I’m writing a post about how to use social media for your business, I might link to my other posts on my favorite social media tools or the best ways to use Twitter for marketing. This strategy is not only great for keeping visitors on your site longer, but it boosts the ranking of those posts and pages in the search engines. So…once you’ve written your post, think about which other posts on your site would be helpful for your readers and include links to those posts. You’ll also want to go to other posts on your site and link back to the NEW post you’ve just written. 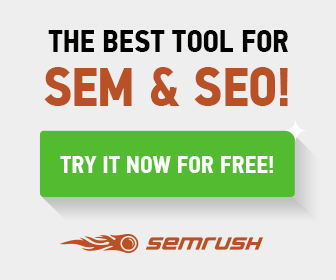 This will help your visitors find your new post, and will also give your post a boost in the search engines! Writing and publishing your post will NEVER be enough. People who are subscribed to your blog may visit the post, but that’s about it. Every time you publish a post, have a plan for how you’re going to promote it to your audience. There is no use in publishing content without a plan to amplify it. If you mention certain people in your post, let them know. They may share your post with their audience! Send your post to past clients or customers who you think would be interested. Just do this very carefully or you could be accused of spamming. This is the step that will start driving traffic to your post from day one, so it’s SUPER important that you’re intentional about it. As your post gets read by more people, it will start to get shared and linked to. And as your post gets shared and linked to, it will reach even MORE people. These links and shares will also seriously boost your search engine rankings, which means even MORE traffic in the long-term. This means your post can start driving traffic NOW, but will continue to drive traffic for months or even YEARS to come – not bad for one little blog post! 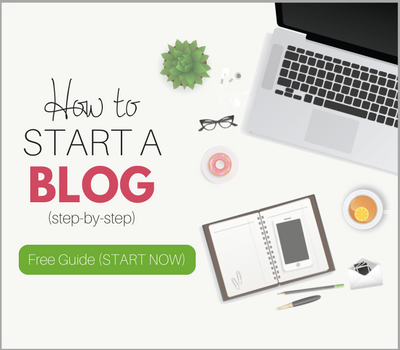 Are you at the beginning of your blogging journey, and aren’t sure where to start? 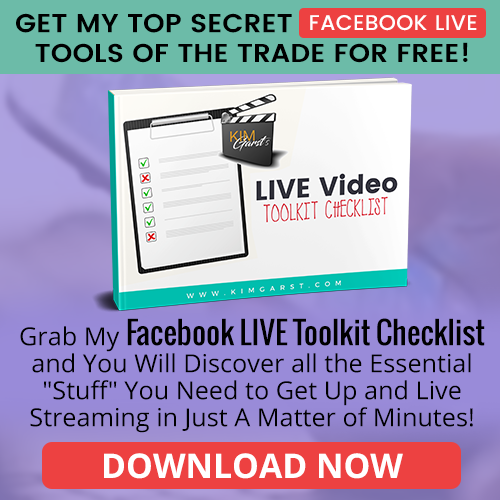 I’ve compiled some resources just for you! Now over to you! 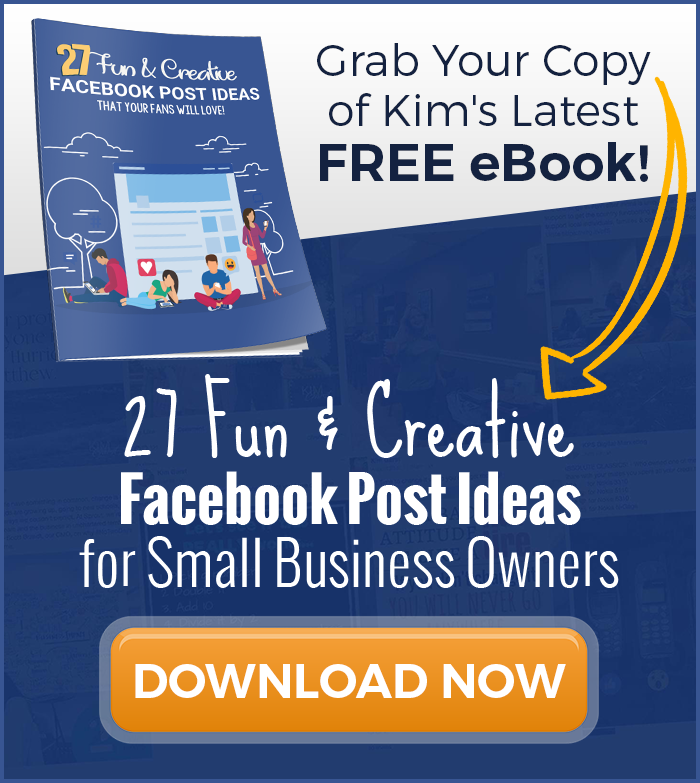 Would love to hear how YOU drive traffic to your post blogs from day one? Any tips, tricks or strategies you’d like to add? Share below! Thank you so much. Glad you benefited from the post! We should be conscious of placing appropriate keywords throughout every aspect of our site – our titles, content, URLs, and image names. We need to think about our keywords as search terms, how would someone looking for information on this topic search for it. People expect some unique stuff that is different from every blog if we will successful in providing unique content or unique product that is different from the others our blog or product will grow up automatically. You have explored great tips regarding subject and they are very helpful to maximize productivity level. Eventually, thanks for sharing your healthy thought with us. This is a great article. This will definitely going to boost my traffic rank. I bookmarked this for further reading. You have given some really Amazing Post! Thank you for the ideas. I hope you are doing well. Actually, when I seeing these tips, it remembers me one of the quotes of Li Evans “Content doesn’t win, optimized content wins”. This is 100% true!. Because optimized contents help you to reach targeted audience and also help you to drive an organic traffic as well. Thanks for sharing the masterpiece, my friend! Thank you very much for all your advice and tips! 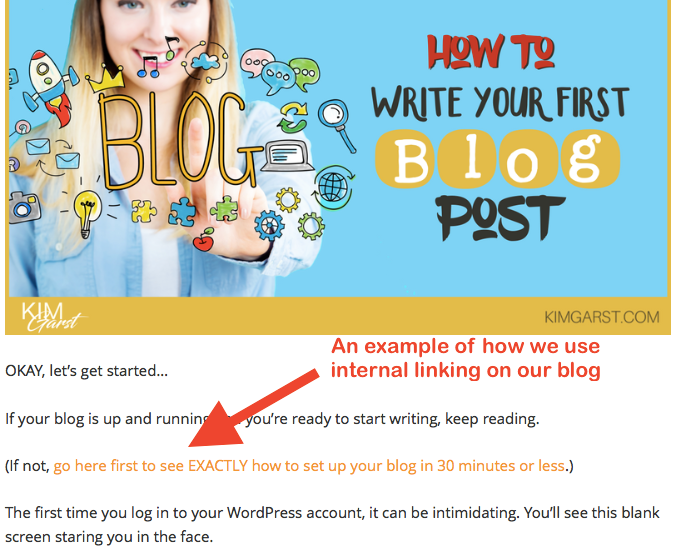 It’s seems like a great guide – easy to understand and follow.Just wanted to chime in tell that WordPress is indeed one of the best and most flexible blogging platforms out there. I started out on Blogger, but soon moved onto WordPress. to know tnose who are behind thhe company better, so that it is easiwr so they can trust yyou and spend moiney on your site. I use internal links, tag 3/4 friends on fb also 3/4 groups. Promote 2/3 times daily on fb, twitter, Linkedin, Pinterest. I like your images. Where can I find this kind of images? Is it free images? Wow, such an extensive article. This is a great help for me, because I’ve been struggling with finding the right subjects to write about. Just a amazing and problem solving post for me.really appreciated. I already do interlinking to blog post and social share to get more attention but here I learn some things like- survey your audience and create more content that user need…like that.. Thank you so much for your great post. Thank you for this post and useful information. They are amazing information are provide. They are Post a link on social media, Promote social list , promote ads , share in industry group, and others.I will sharing in this post. Thank you for this post and useful information. They are amazing information are provide. They are Post a link on social media, Promote social list , promote ads , and others.I will sharing in this post. Thank you for this post and useful information. They are amazing information are provide .I will sharing in this post. I really like what you guys are usually up too. This type of clever work and exposure! Keep up the fantastic works guys I’ve included you guys to blogroll. When you contacting Alexa Amazon, you have the option of sending an email, having Amazon call you, and live to chat. This article will show you how to talk with a customer service representative at Amazon. If you want to call Amazon directly, contact our customer service. Contacting Amazon Prime was a pure delight. We didn’t have to wait through a lengthy automated system; just a few options one being the customer support team. Hello, very supportive information you share. Here is an important lesson you teach me.